If you are not familiar with someecards.com, checkout the site now. It's a brilliant site that takes a sarcastic stab at the greeting card industry. 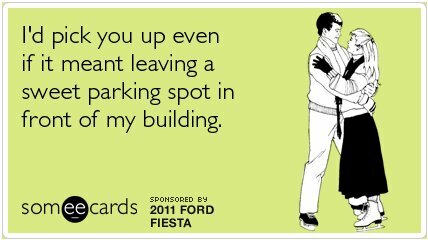 Ford has become the first automotive company to sponsor someecards eCards. The Fiesta launch gives Ford a youth oriented product where it can have some fun with its media communications. 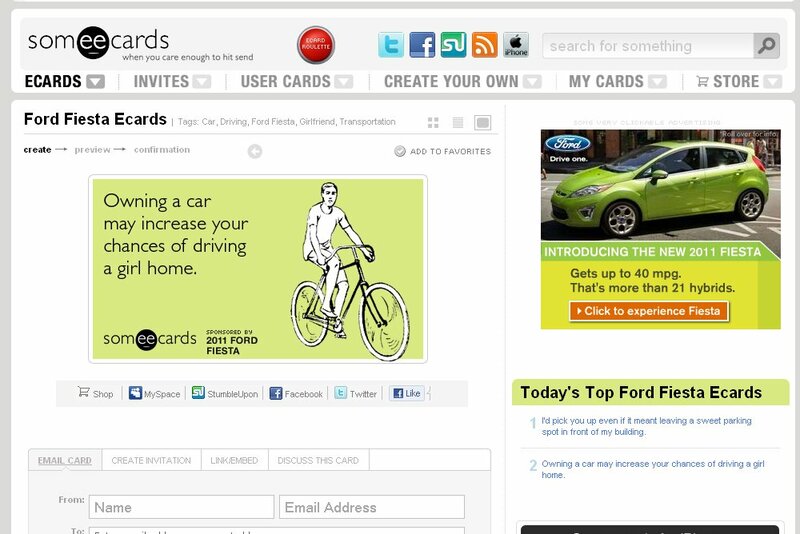 Two eCards are now available on the someecards.com site that feature automotive messaging along with a "Sponsored by 2011 Ford Fiesta" label. It's a playful way to have some fun with the product and tap into the existing viral success of the someecards website. The Ford Fiesta sponsored eCards are accompanied by a couple banner advertisements from the Fiesta campaign to help strengthen the alignment with the vehicle's marketing goals to drive consumers to the FordVehicles.com shopping site. I am reading micromarketing by Greg Verdino. I don't read business books but Aaron Strout sent me a copy. I don't agree with everything in the book but the fact that Brands need to look at more places to reach groups of people is dead on and this is a great example. When is the ATT card coming out? I would love to do an AT&T card, but Ford beat me to it. Will have to do something more inventive. The humor business is a tough one. Humor is probably the most difficult emotion to be able to capture - either you get it dead on, or you miss it by a mile. We had been working with the someecards guys for a while before we each agreed on a direction, and it seems to be working. Thanks for highlighting it!